I had told myself I wasn't going to review any more nail wraps once I'd done the ones I already have, because I have a volatile relationship with wraps due to my long curvy nails. However, I realised they're quite popular with people who aren't so much into doing their own nail art or want something quick, so my quest for the perfect nail wrap is continuing for now! I was intrigued by Nouvella wraps because you apply them using heat from a hair dryer, which is something I haven't tried before, so I decided to give it a go. The idea is to heat them a little with the hair dryer first to make them soft and pliable, then press them down to one side of the nail and smooth down. You then apply more heat and smooth the other side down. Basically you keep re-heating until you've smoothed the wrap over your nail. The wraps come with detailed instructions. I chose the skyscraper design, and armed with my hair dryer, set about applying them. It went pretty well! Probably my best result from wraps so far, maybe the secret is using heat? They're still not 100% perfect and have a crease here and there, but I'm reluctant to blame that on the wraps as I know my nails are curved into almost a complete C shape, which makes application a bit more difficult than it would be for someone with flatter nails. The creases are barely visible though, luckily! 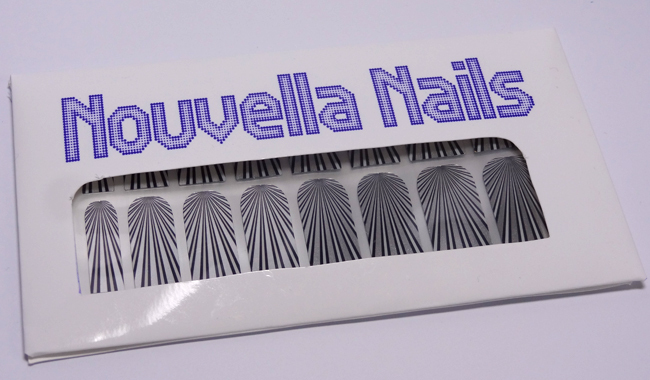 Nouvella nail wraps come in packs of 16 wraps in 3 different sizes. They cost £3.99 per pack with £1 delivery to all countries! They've been kind enough to offer a 20% off discount code to readers of my blog. Just visit http://www.nouvellanails.com and enter code BRITNAILS2013 at the checkout. I haven't tried wraps... I prefer working on my own nails, it's really relaxing. WOW! I'm not big on wraps, but the perfection you achieved here has my interest piqued again. omg these are so pretty. AND U HAVE PRETTY HANDS. i like u.
these look awesome and i LOVE your ring! !